A massive fire engulfed the upper reaches of Paris' soaring Notre Dame Cathedral as it was undergoing renovations Monday, threatening one of the greatest architectural treasures of the Western world. The world reacted with shock, horror and prayers to the massive fire, united in grief and in solidarity with the people of France. US President Donald Trump assessed the response from 4,000 miles away and offered unsolicited advice for firefighters trying to save Paris' Notre Dame cathedral. "Perhaps flying water tankers could be used to put it out," Trump tweeted from Air Force One, minutes before landing in Minnesota for a Tax Day speech. "Must act quickly!" Trump's armchair observations were striking, even for a president who seems to offer an opinion about just about everything. Portuguese President Rebelo de Sousa and Prime Minister Antonio Costa on Monday respectively sent their heartfelt condolences to French President Emmanuel Macron. 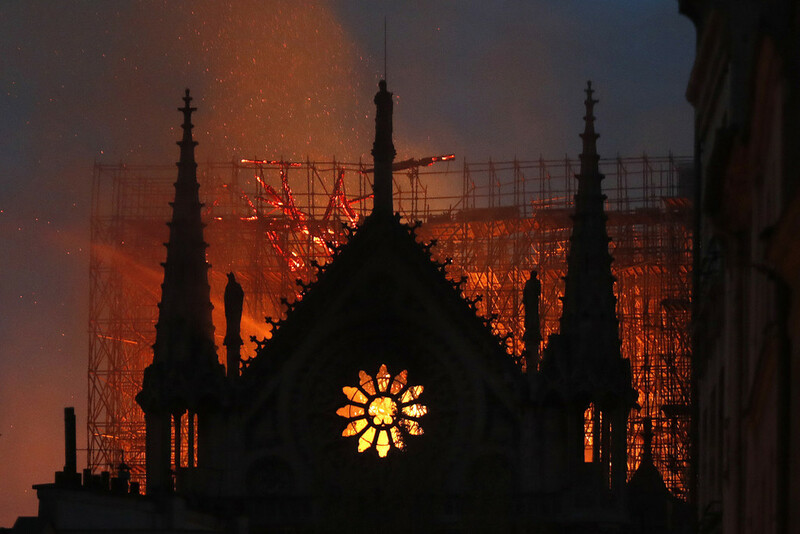 The fire engulfed the Notre Dame, hurt the heart and soul of the people, because the cathedral was a major symbol of the human imagination, said the president in a message, published in the portal of the Presidency of the Republic on the Internet. "It is a tragedy for the French people, for the Europeans and even for all the world," he added. Prime Minister Antonio Costa also conveyed messages of solidarity for the "terrible fire" to the French president. "I have just expressed my solidarity with French President Emmanuel Macron and the mayor of the city, Anne Hidalgo, for the terrible fire at Notre Dame Cathedral in Paris. A part of our European history disappears under the flames," wrote Antonio Costa on the social network Twitter. Italian leaders late on Monday expressed solidarity with France. In a message to Macron, Italian President Sergio Mattarella wrote that "the whole of Italy stands in sincere friendship with the people of France". Mattarella described the Cathedral of Notre Dame as "a historic treasure that has housed an exceptional artistic heritage of immense significance for France, for Europe, and for world culture" in his message, which was published by Italian news agency ANSA late on Monday. Speaking to RAI public broadcaster, Prime Minister Giuseppe Conte said he will contact the French government "to express the extreme and moved participation on the part of the Italian government and the Italian people in this bereavement, because I consider this a true bereavement". The prime minister added that Notre Dame was "a monument of the French identity and of all those who loved the values of Western civilization". Deputy Prime Minister Luigi Di Maio tweeted that "I stand with the people of France over this terrible fire that has struck the Cathedral of Notre Dame, a heritage of humanity as a whole. For Paris and for France, the support of the entire Italian government!" United Nations Secretary-General Antonio Guterres expressed his "horror" at the images of the fire, shown live around the world. "Horrified by the pictures coming from Paris with the fire engulfing Notre Dame Cathedral -- a unique example of world heritage that has stood tall since the 14th century. My thoughts are with the people and government of France," the UN chief said on Twitter. Audrey Azoulay, head of UNESCO -- the Paris-based UN agency for education, science and culture -- also expressed her "deep emotion" on social media. Azoulay wrote that UNESCO is closely monitoring the situation and is standing by the French people's side to "safeguard and restore this invaluable heritage." The UN elevated Notre Dame, widely considered to be one of the finest examples of French gothic architecture, to world heritage status in 1991. Germany Chancellor Angela Merkel on Monday has said she was deeply saddened by the Notre Dame cathedral fire in Paris. Government spokesman Steffen Seibert tweeted on behalf of Merkel: "It hurts to see these horrible pictures of the burning Notre Dame. Notre Dame is a symbol of France and of our European culture. Our thoughts are with French friends."